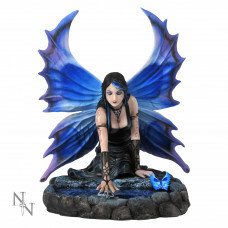 This alternative Fairy figurine comes from the Gothic imagination of world-famous Fantasy artist Anne Stokes. In an enchanted forest at night, a young Fairy kneels in front of a still pool as the moon shines through the trees. Her blue and purple wings are unfurled behind her, matching the blue butterflies that flitter around. Her green dress is sleeveless, exposing her Celtic tattoos and silver torcs above the fingerless leather gloves she wears. Her straight black hair has blue streaks through it and hangs down as she reaches out to a human skeleton, barely submerged in the pond. Light shines from her hand as ripples spread outwards from whatever dark magic she’s performing, and if her wings are inspected closely a large death’s head is visible. Cast in the finest resin before being expertly hand-painted, this enchanted figurine is a great way to add a delicious touch of darkness to your home.